Posted by dissident93 in Media Criticism, Medialens. This seemed a good opportunity for Medialens to practise what they preached. They’d already criticised the media (but not the New Statesman) for being “almost unanimous in describing the elections as democratic and free” (NS, 24/1/05). Now they could use their NS column to criticise the magazine and its editor, Peter Wilby. In other words, Medialens were concerned about holding onto their column. Direct “full-frontal” criticism of the NS would endanger that. Their concern was understandable, although they’d previously asked George Monbiot if he’d considered resigning as Guardian columnist in protest at the Guardian’s performance over Iraq (Alert, 2/12/02). Presumably it didn’t occur to the Medialens editors to ditch their own column over the NS’s performance. The Guardian comment editor, Seumas Milne, has even had the gall to complain that the elections “are routinely described by the BBC as Iraq’s first free and democratic elections”. So, Seumas Milne was judged by Medialens to be higher than the NS in the hierarchy of “serious wrongdoers worthy of Medialens’s criticism”? 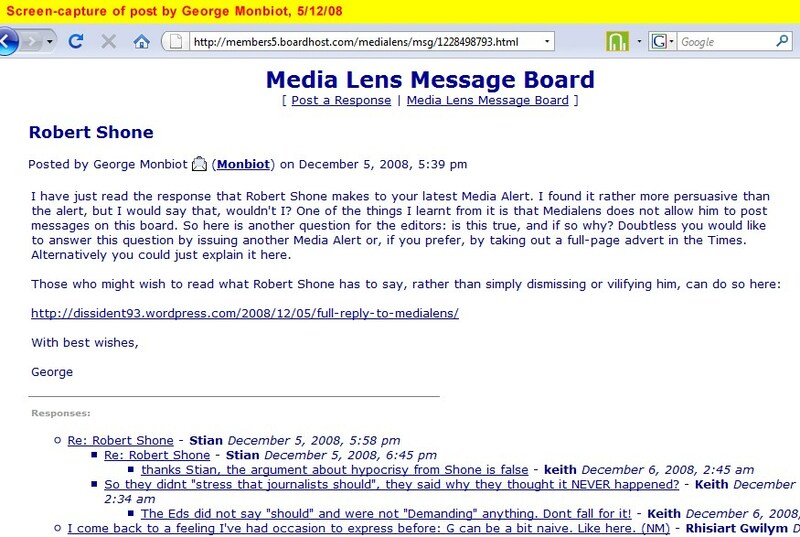 It’s curious that apart from a different emphasis on criticising the media, Medialens’s NS column (24 Jan 2005) is very similar to Milne’s Guardian column (13 Jan 2005) – the same Tony Blair quote in the opening paragraph, exactly the same points about elections conducted by puppet regimes, the Fallujah refugees unable to vote, government crackdowns on al-Jazeera and press, the absence of monitoring by election observers, etc. One wonders why Medialens were so hostile towards Milne [the Medialens editors continued their rant on their message board, accusing Milne of taking “risk-free swipes” at the BBC, and of having a “superficial” output compared to John Pilger’s, etc(4)]. Even allowing for Medialens’s particular focus on “failings of the liberal media” it seems a strange overreaction. 3. I found only two cases (27/10/03, 23/2/04) of Medialens criticising the NS in their run of NS columns. Both very brief (total word-count of criticisms = 108). Monbiot’s criticism of the Guardian in his Guardian article is 116 words long.